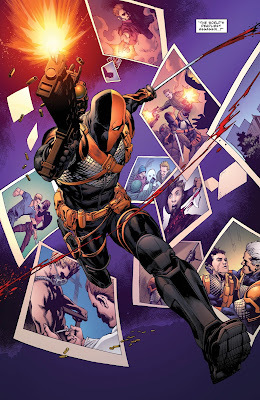 “Deathstroke #1: The Professional Among Thieves,” written by Christopher Priest, with art by Carlos Paqulayan, Jason Paz and Jeromy Cox, begins with Slade Wilson being betrayed. Wilson accepted a mission that takes him to a war-torn African country. Wilson finds himself in the middle of a crumbling alliance between a dictator and a supervillain. 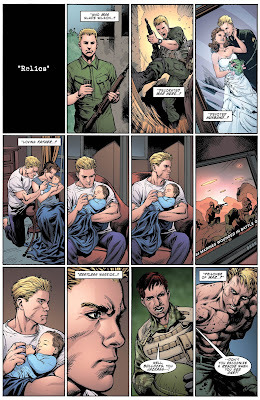 With a country caught in the cross-fire, Wilson must choose between his own mercenary code and saving an old friend. Meanwhile, how will Wilson maintain stability at home? 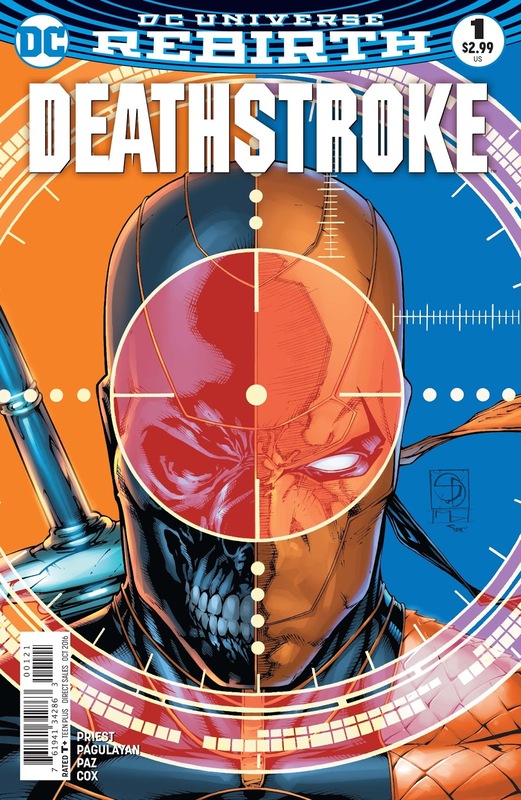 As the new Deathstroke story-arc begins, we finally get to see what drives Wilson and how his past affects his present. 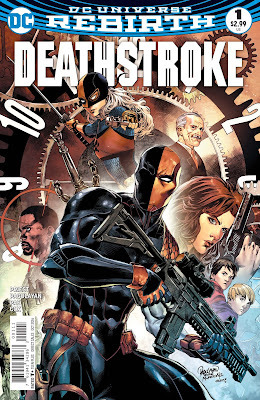 Having never read a Deathstroke story-arc, I was a bit confused by this issue. It is essential that you read the Deathstroke #1: Rebirth issue to get a better sense of what’s happening here. As it turns out, “The Professional Among Thieves” acts as a #2, because it picks right up after Deathstroke #1: Rebirth (released August 10, 2016). This episode is very dialogue-heavy, moving the plot along gracefully. Additionally, the dialogue delivers a balanced aspect of Wilson’s background and his humanistic qualities. Priest successfully does not make Wilson a sympathetic anti-hero, but depicts Wilson as a family man with a code and conscience… though Deathstroke never hesitates to kill. The plot continuously jumps back and forth between past and present events. Priest intends to delve more into the characters background by using this technique and does so successfully. However, jumping back and forth can confuse first-time readers. Readers won’t know when he is in the past or in the present unless previous issues are read. The back and forth formula becomes murkier considering the villain is the Clock King, who can control time. Who is the Clock King? Why is he in need of protection? How do his powers work? 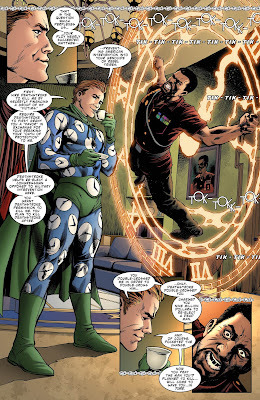 Perhaps the Clock King’s presence here is the foreshadowing of another villain, who is more powerful. Maybe more insight into the Clock King’s powers will reveal this! It could be anyone from any point in time! It’s nice to see DC using the complexity of its villains. Giving insight into the mind of a villain proves that being a villain is just as stressful as being the hero. Oftentimes, villains have responsibilities and morals especially as it pertains to family. As the Wilson family is in the beginning stages of falling apart, the art team really delivers on this portion of the episode. Wilson’s wife wants a divorce and his sons are having some growing pains. The scuffle Wilson and his wife share is very well done and builds tension nicely especially with Wintergreen’s effect on the Wilson family. I am anxious to see what happens with the potential divorce and the rest of the family dynamic. THE VERDICT: Priest delivers a modern story involving issues of today including politics, roles of women, and American intervention abroad. This saves the issue for me. The anxiousness for more specifics, as to where DC and Priest go with one of their most complex super-villains has me wanting more.